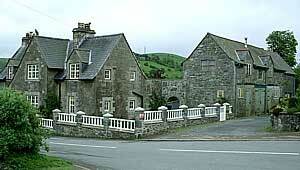 Discover Llangurig at the Heart of Wales. Situated on the banks of the River Wye among the beautiful rolling hills of Plynlymon. Llangurig is the perfect location to discover Montgomeryshire and an ideal holiday base to explore Wales. Situated on the banks of the River Wye among the beautiful rolling hills of Plynlymon. Llangurig is the perfect location to discover Montgomeryshire and an ideal holiday base to explore Wales. With a 15th century church containing fine armorial stained glass and also the Royal pew of Prince Albert, later King George V1, the village has good examples of arts and crafts architecture by W.A.S. Benson. Different types of accommodation offer a wide choice throughout the year. The surrounding countryside, with outstanding scenery, provides the opportunity for an extensive range of activities, including walking, scenic car drives, golf, sailing, fishing, clay pigeon shooting, horse riding and canal trips, bird watching, and you can visit fine gardens and country houses. 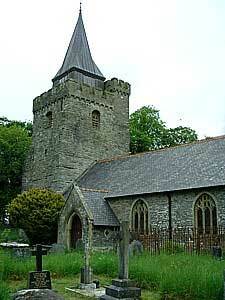 Llangurig Parish Church - founded before 550 AD. The present buiding is largely 15th century and was sensitively restored by Sir Gilbert Scott. Fine woodwork and stained glass windows adorn the building. Ask about the metal grid? - one of the last remaining!! Devil's Bridge - 20 miles west on the A44. (Find out why it is called Devil's Bridge!) There is a spectacular waterfall and terminus of the Rheiddol Light Railway. Elan Valley Dams - Visitor centre and cafe 10 miles south on the A470 and turn right. Spectacular scenery and the water supply for Birmingham, Powys Castle and its many gardens. Red Kite centre - Rhayader where you can see them feeding. Clywedog Reservoir - 7 miles north east. For fly-fishing and sailing. Licenses and boat hire from Travellers Rest Restaurant in Llanidloes.